While fried ice cream is definitely an American invention, there's a lot of controversy as to when it came into existence. Some say its birthplace was Chicago's World Fair in 1893, at the same time the ice cream sundae was introduced. Others say it was the brainchild of Japanese tempura restaurants of the 1960s. 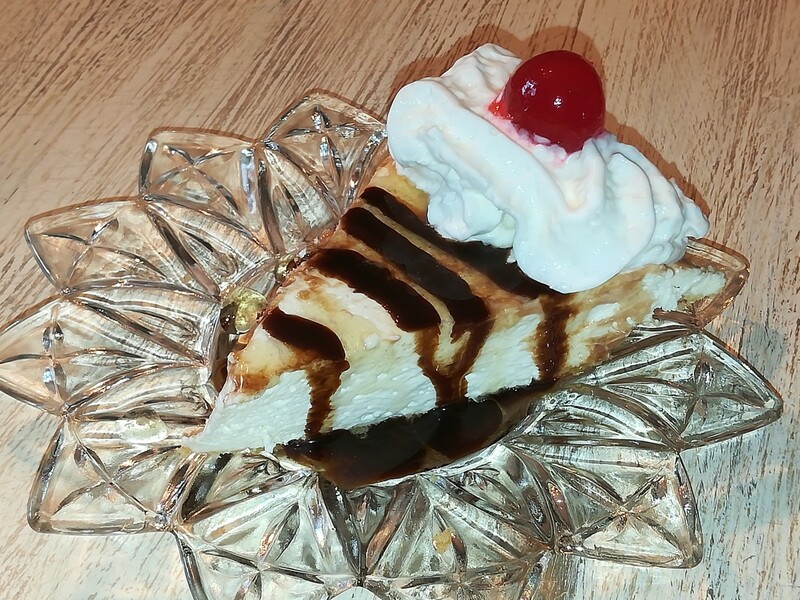 But one thing is certain: fried ice cream came into popularity in the United States in the early 1980s, when it was adopted by a popular Mexican restaurant chain. What keeps fried ice cream from melting? First, the ice cream balls are frozen very hard, so a brief immersion in hot oil creates a crisp coating on the ice cream. Although fried ice cream is traditionally served on a cinnamon-sugar tortilla shell, why not try it with sopapillas for a spectacular treat? Finish it with pear-honey sauce and you'll have the perfect grand finale for a Mexican feast. Enjoy! Completely crush the crackers and cornflakes in a blender before measuring. Allow plenty of time for the ice cream balls to freeze. If they're too soft, it will be impossible to roll them in the cornflakes. Freeze cornflake-covered ice cream balls on a cookie sheet lined with plastic wrap. The plastic will make it easier to peel off the very frozen ice cream balls without damaging them. Scoop ice cream in 1/2 cup portions. Form six balls and freeze until firm, about 1 hour. Combine crushed cornflakes, vanilla crackers and cinnamon in a bowl. Place egg whites in a bowl. Whip until foamy. Roll balls of ice cream in egg whites then in crumb mixture. Repeat the process, rolling them again in egg whites and crumb mixture. 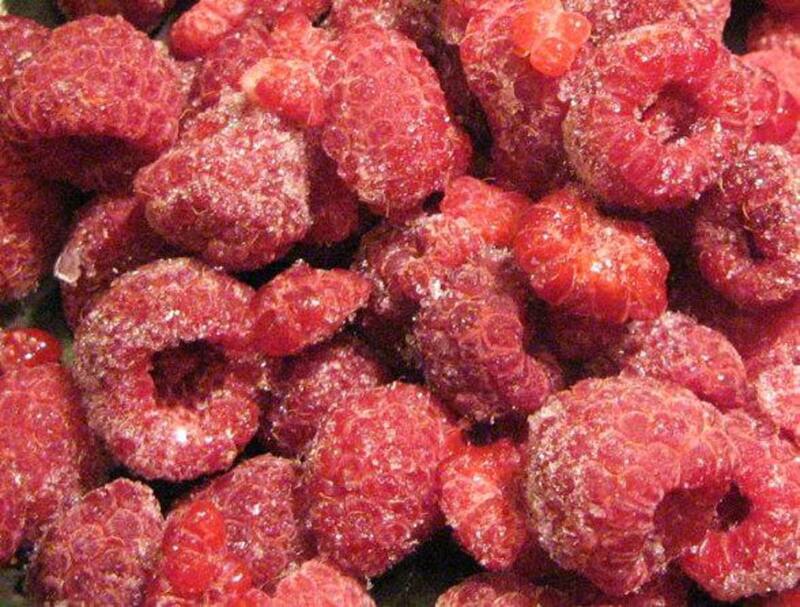 Freeze until very firm, 3-4 hours. Heat vegetable oil to 400 Fahreheit (204 Celsius). Fry ice cream balls for 10 seconds, or until golden. Drain on paper towels and serve immediately. 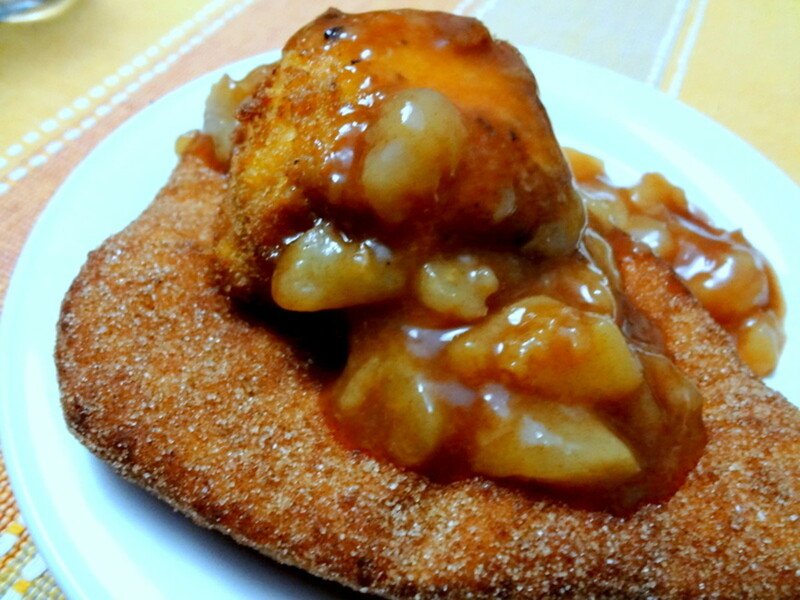 *Horchata ice cream is the perfect complement for cinnamon-coated sopapillas. Our second choice is high quality vanilla or chocolate ice cream. 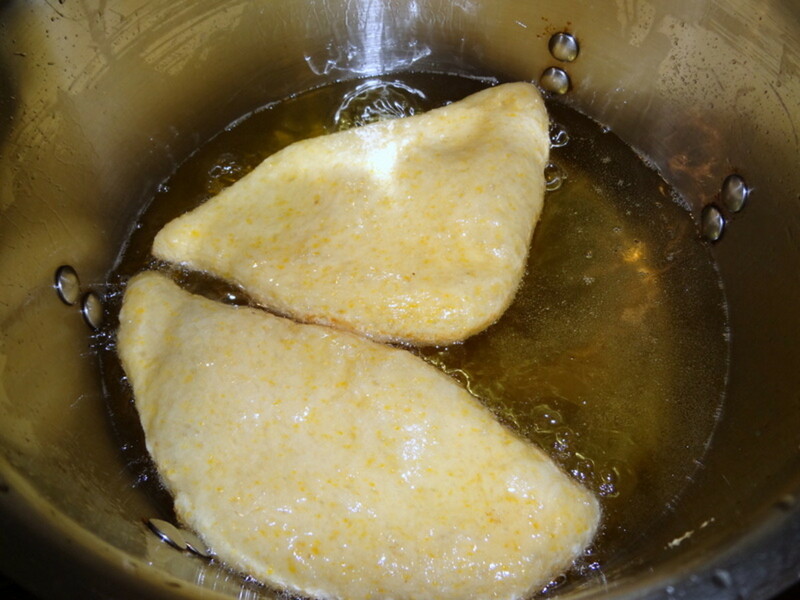 Cornmeal gives the sopapillas an extra crunch. Served leftover sopapillas and honey for breakfast, instead of donuts. In a medium bowl mix milk, egg and butter. Set aside. Combine wet ingredients and dry. Mix with a wooden spoon until dough forms. 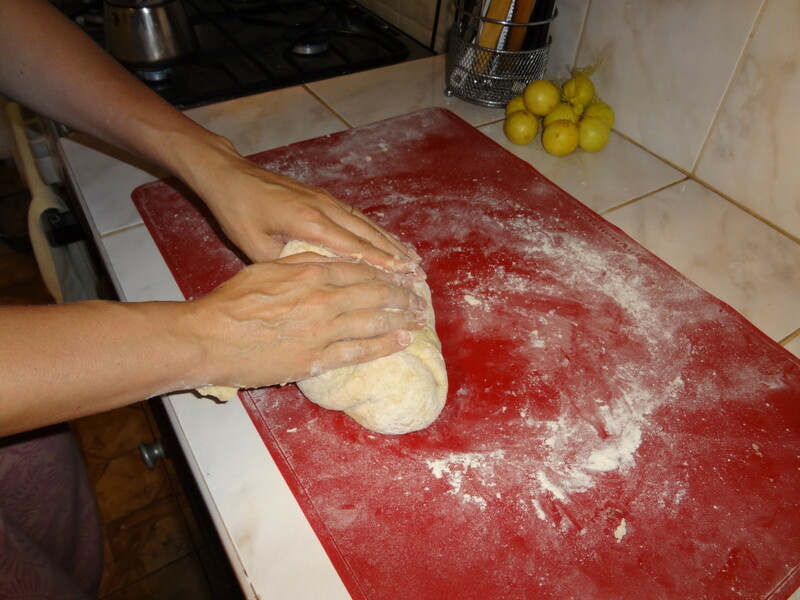 Place dough onto a floured surface, such as a countertop, and knead until elastic and smooth, about 8 minutes. Add more flour, as necessary, to keep dough from sticking. See video at right for information on "how to knead". 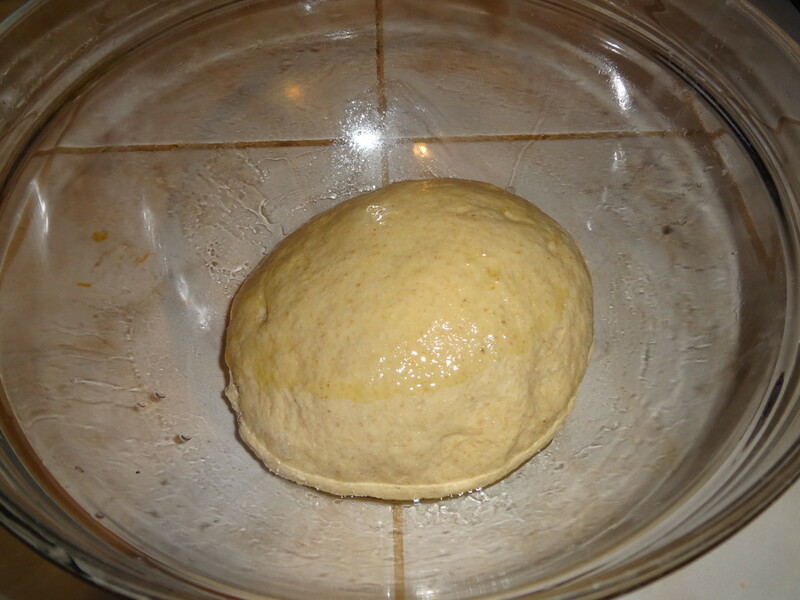 Place dough into a greased bowl, cover with a towel and leave in a warm place for 1-2 hours, until double in size. Punch down the dough and place on the floured surface. Using a floured rolling pin, roll dough out into two circles, 1/4 inch. Using a knife, cut the dough into wedges as you would slice a pizza. You should have 16 wedges. Heat vegetable oil in a medium saucepan to 375 Fahrenheit, or 191 Celsius. 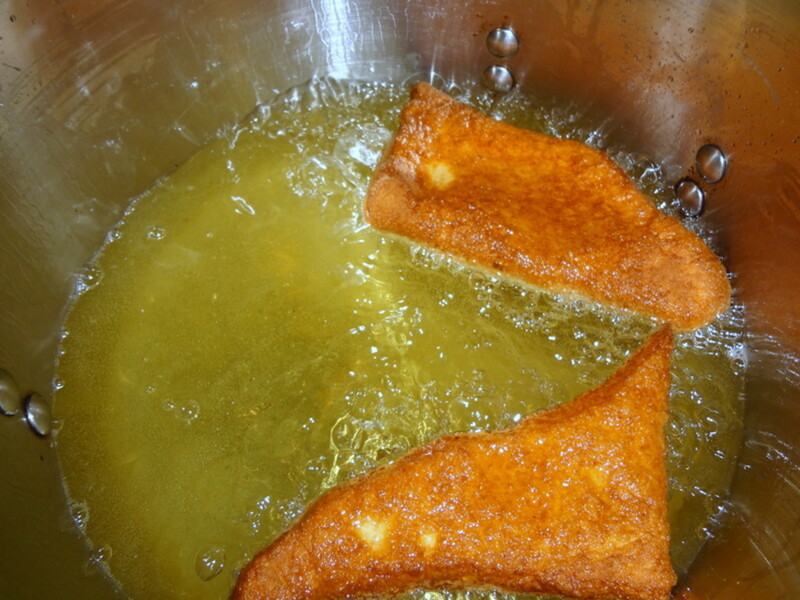 Fry sopapillas, 2-3 at a time, until golden brown. As they puff and turn golden, flip them over and cook on the other side, about 2 minutes total. Combine 1 cup white sugar and 1/2 teaspoon cinnamon on a large plate. 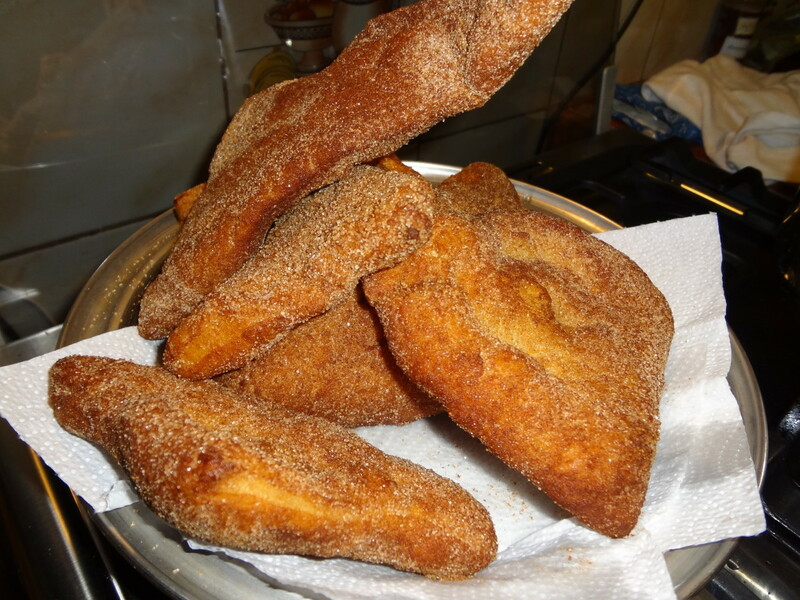 While sopapillas are still warm, roll them in the cinnamon and sugar. In a medium saucepan, bring water and sugar to boil. 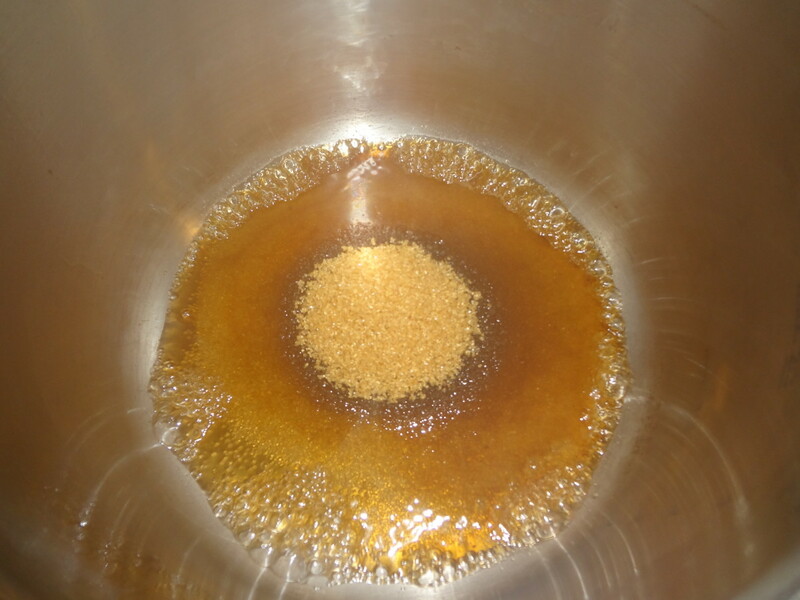 Continue boiling until sugar dissolves, about a minute. Add salt and cubed pears. Simmer on medium heat for a minute, or until pears are tender. Combine 1 Tablespoon cornstarch and 2 Tablespoons water to make a slurry. Quickly stir the slurry into the pear/sugar mixture. Continue to boil for about a minute longer, stirring constantly, until sauce thickens. Add vanilla and allow to cool before use. Store in refrigerator up to one week. Arrange one sopapilla on each plate or bowl. 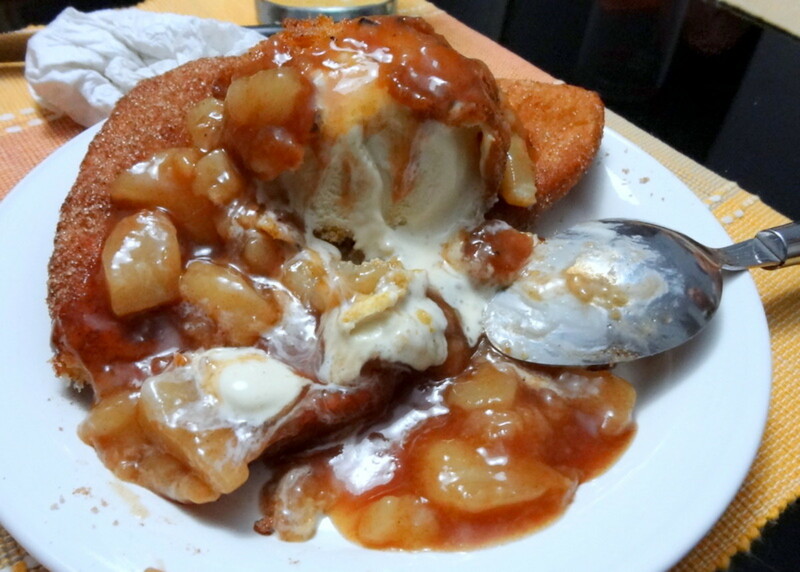 Top with fried ice cream and serve with pear-honey sauce on the side. Blond Logic, I appreciate your enthusiasm for this fried ice cream recipe. It's quite a bit of work but so worth it, especially when you share it with friends and family. Thanks for your comment. I have never had fried ice cream. I also haven't tried sopapillas before. I've got to get out more! I imagine this makes a wonderfully rich dessert. 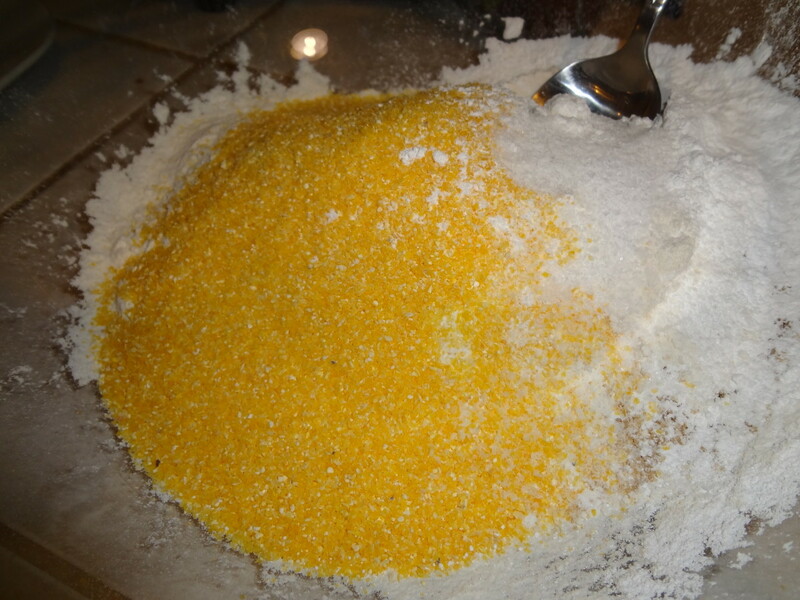 I love using cornmeal in recipes. I suspect this will become a staple on our household dessert menu. Careermommy, this recipe does require a bit of work but it's a great ending to a meal for special guests. Thanks for your comment and have a great weekend. Rebeccamealey, the combination really is delicious although sometimes we only have time to make the sopapillas. : ) I hope you can try it sometime. Thanks for your comment! vespawoolf, this looks amazing. I've always wanted to try fried ice cream. The recipe seems intense, but well worth it! What a delicacy! II have had sopapilla (loved Them) but this sounds so different and unique! Au fait, thanks for the pin and comment! Although this dessert does require a little bit of work, it's the perfect ending for a Mexican feast. Have a nice weekend! This recipe looks so yummy and tempting that I had to revisit this hub so I can share it again with my followers and this time (just got a new Pinterest acct. a couple of weeks ago) I'm going to pin it to my Fabulous Deserts board. tattuwurn, I'm glad you found an exciting way to use your ice cream. Thanks for the votes and comment! Livewirez, although fried ice cream requires a little preparation and time, it's so worth the effort! Hope you can try it sometime. I love it.. Looking at the images only it makes me wanna eat it already.. Au fait, I definitely recommend trying fried ice cream! It's such a unique creation and worth the extra effort. Thanks so much for the votes and comment! This looks yummy. I like sopapillas and pear-honey sauce. Believe it or not, I've never had fried ice cream. The photos look so good, I may have to try this. Gave you 5 more stars and voted you up and interesting! Moonlake, I'm glad you've tried fried ice cream before.The sopapillas are also delicious on their own as a special treat sometime.Thanks again for your support! This looks really good I love fried ice cream. I've never had sopapillas. Voted up. Peggy W, this dessert does require a lot of preparation but it's nice for something special, especially after a nice Mexican food meal. Thanks for all your support! I love warm sopapillas served with honey although I have not had them in quite some time. I have never had fried ice cream. Sounds interesting. Your photo makes the combination look extra good! Thanks for the recipes. Up and interesting votes. Kat_thurston, sopapillas are wonderful and especially while they're still warm and soft. I'm glad you enjoyed the recipe and thank you for taking the time to leave a comment. WOW! thanks for sharing this wonderful recipe. I had these once remembered how good they were and been trying to find a good recipe ever since. Will defintealy be adding this to my list of ones to try. MamaKim8, this one is a lot of work. I only fry for company, but sopapillas are pretty yummy. The pear honey sauce would be great on oatmeal! What a smart idea. Thanks for commenting and voting! Mvillecat, thanks so much for your kind words! I'm glad you enjoyed the hub and plan to try the recipes. I appreciate the pin and comment, too! I have pears waiting on my counter to be made into pear honey. This is a beautiful Hub and I have wanted to try making sopapillas for a long time. I have pinned this to my recipes. Thanks. 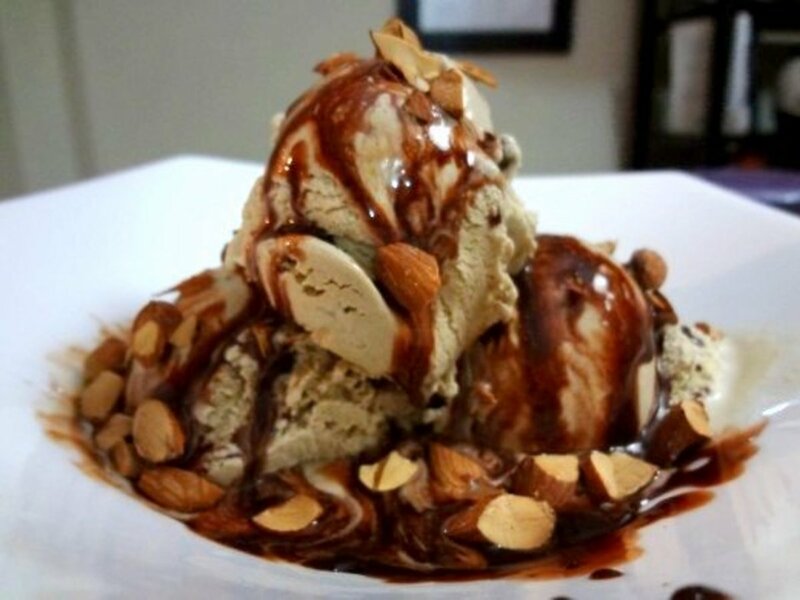 ishwaryaa22, enjoy the fried ice cream sundae! 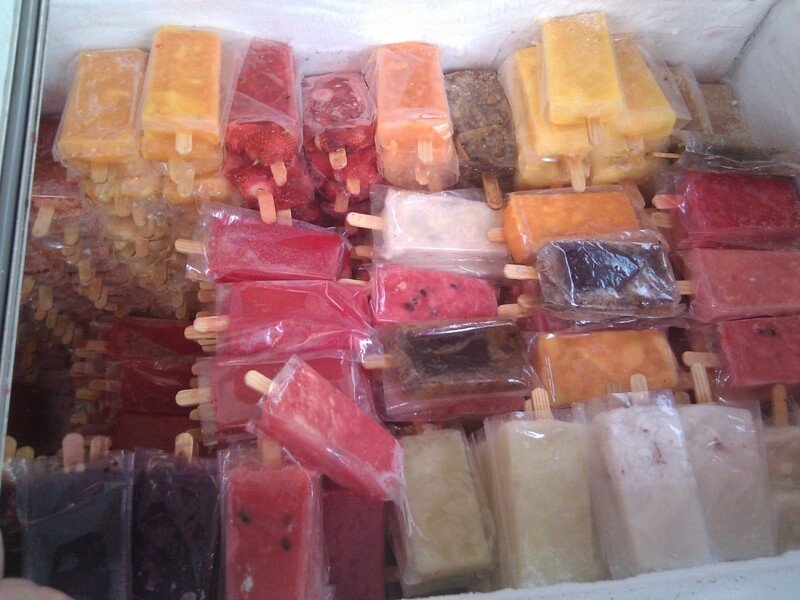 It's a delicious treat anytime, but especially on a hot day. Thank you for your kind words, the vote and share. A unique dessert hub! I have not tried all these 3 before! The first and last photos look drool-worthy! Your 3 recipes are clearly explained. I would like to give this yummy dessert a try. Rated it 5 stars! Well-done! Anamika S, thanks for the vote and your comment! I have never tried a Fried Ice Cream. Would love to try that! Awesome Hub, voted up! JSMatthew, thanks so much for your kind words! Fried ice cream isn't difficult to master with a little practice. 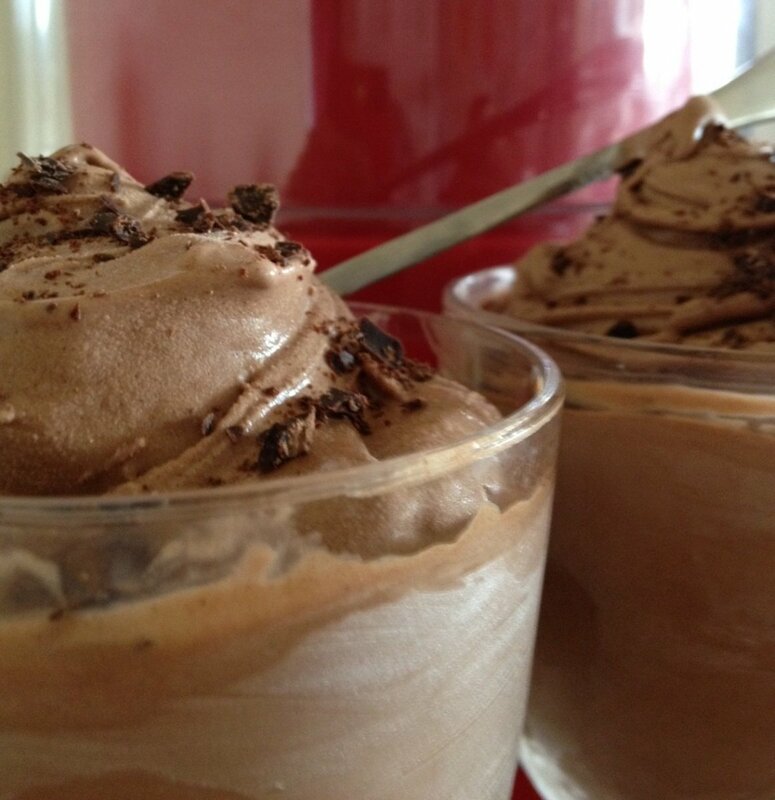 Enjoy the recipe and thanks for taking the time to read and comment. I love the cornmeal in these sopapillas for the added crunch. Some sopapillas are leavened with baking powder, but taking the extra time to make them with yeast is so worth the effort. Thanks for taking the time to read and comment. This is really great! I have tried this a few times before and always wanted to know how to make it at home...now I do! I have bookmarked this in my browser folder for recipes. I voted and am sharing! This should be a hub of the Day! I've been missing my sopapillas ever since the restaurant nearby that made them just closed up. This is a great substitute. Voting this Up and Useful. SHARED. Wow Rebeccamealey, you make me feel so good about my hub! Thanks a lot for the kind words. Wow, does that look good! I have had So-papillas . Loved them! The pear sauce is so unique. Your food photography skills are the creme de la creme.Sharing for sure! creativelycc, thank you for taking the time to read and comment. 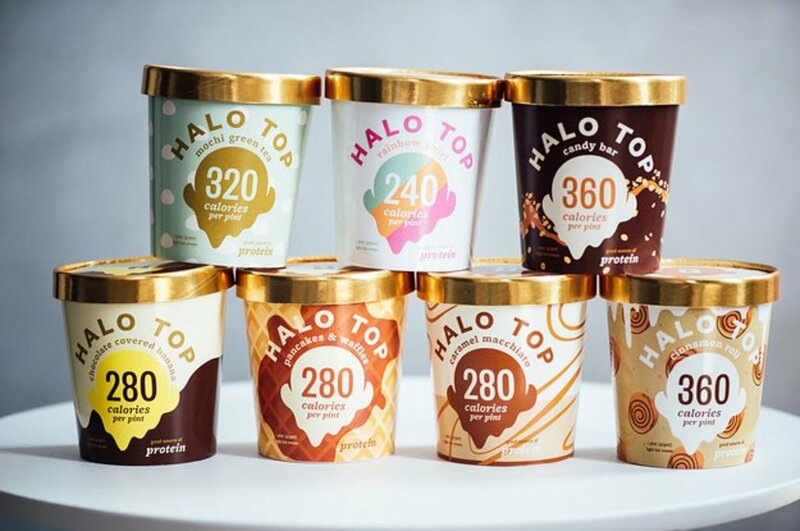 I hope you have the chance to try the ice cream! Yum, this sounds so good! I'd love to try it sometime! Ice cream is my favorite desert. But I had never heard about Sopapillas. 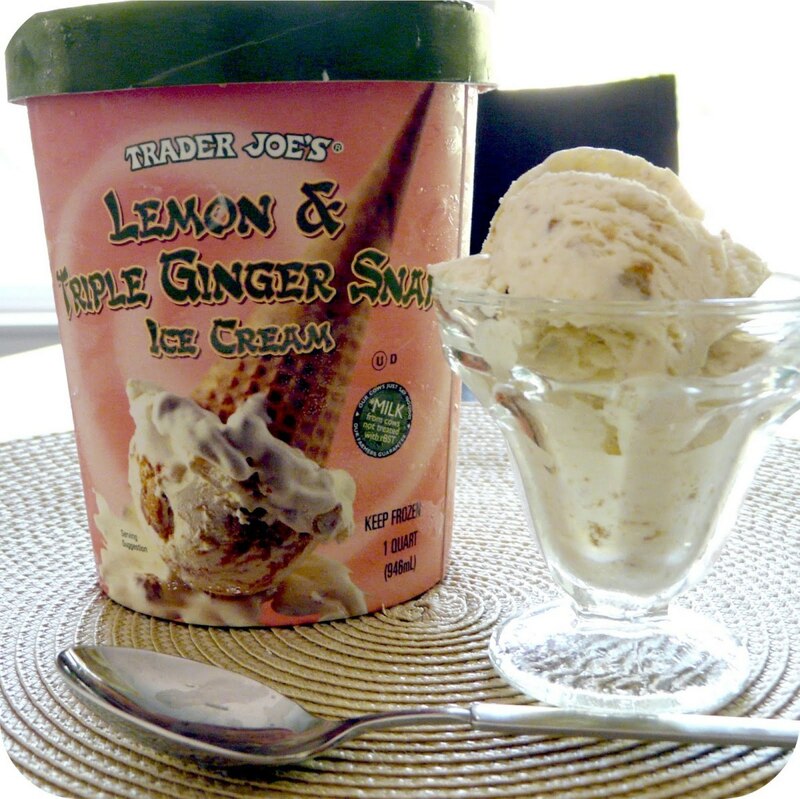 It sound delicious and good combination with ice cream. Voted up and shared. Viking305, thank you so much for sharing and for taking the time to read and comment. Enjoy the ice cream! I never knew there was such a thing as fried ice cream. The photos of your recipe look so good that I have to try this very soon. 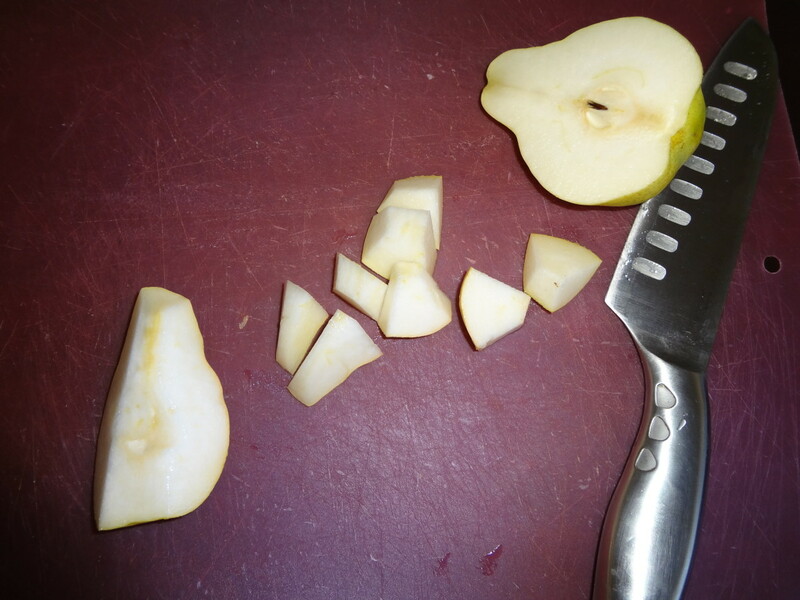 The pear sauce is easy enough to make too from your step by step instructions. StephanieBCrosby, until I did the research I had no idea fried ice cream was Japanese! Thank you for reading and commenting. HawaiiHeart, fried ice cream is extra delicious with sopapillas! Thank you for taking the time to comment. Brett.Tesol, so nice to meet a fellow fried ice cream lover. Thank you for sharing and for commenting! I love fried ice cream. When I go out for Japanese, I always make sure I leave room for dessert, and it is always fried ice cream. Once I did try the Spanish version of fried ice cream. But there was no real comparison. I never thought of making it from scratch though. OMG...love fried ice cream! Never had it with sopapillas before. Thank you so much for sharing! Wonderful hub, extremely detailed and well put together. Fried ice cream is something I only recently had in Asia, but it is oooooooh soooooo tasty ;-). Up, awesome and sharing with followers. Jennzie, you haven't lived until you've tried sopapillas! This recipe is especially delicious because of the addition of cornmeal. They're wonderful served with honey as well as ice cream. That looks delicious- my mouth is watering just looking at the pictures! I've also never had sopapillas but now I definitely want to try them. Molometer, how interesting that you had something similar in S. Africa. Enjoy the recipe and thank you for coming by. These look really tasty. I have had something similar in South Africa. Called a Kooksister. (don't think I spelled that right) but very nice to eat. Om Paramapoonya, this is a delicious combination! It's nice to hear from you again. I don't think I've ever had sopapillas. They look ridiculously good, though! Can't wait to try this recipe. Thelma Alberts, this is a rich, special occasion dessert and I hope you have the opportunity to try it someday. Thank you for commenting! It looks yummy! It is the first time I have heard of fried ice cream and sopapillas. Thanks for letting me know about them. Very informative hub. Randomcreative, I'm happy this recipe could be of use to you. It's always nice to hear from you. Wow, this looks heavenly! Thanks for making the recipe so accessible. I wouldn't be intimated to try this at home now. Buckleupdorothy, a high-powered freezer would sure help the process along. Mine is underpowered, so I have to start a day before the ice cream balls can freeze overnight before frying. It's always nice to hear from you. Thank you, Kelleyward! It's nice to hear from you again. This looks AMAZING. Absolutely something worth trying when I'm visiting my parents and their high-powered refrigerator. Oo, can't wait. LetitiaFT, the secret is throw a dinner party, enjoy a small portion and feed the rest to your guests! lol Thanks for your comment. Victoria Anne, i hope you have a chance to try this dessert and thank you for commenting. Vespawoolf, I have a feeling we're all going to have a few pounds to lose by the end of June if you keep coming out with these scrumptious recipes! This looks amazing! I love fried ice cream and sopapillas but I've never had them together!